Located overlooking the Cowichan estuary in beautiful Hecate Park at the west end of Cowichan Bay Village, the Nature Centre offers opportunities for visitors of all ages to learn about the estuary, the bay, and the watershed through informative interactive exhibits and fun hands-on activities. School programs and interpretive programs for other groups can be booked at any available time. We also offer weekly summer science camps, host films and other special events. We also do facility rentals. 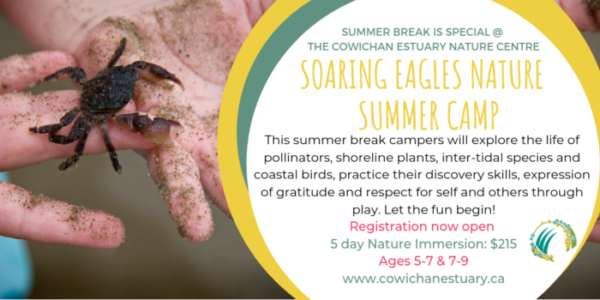 The Cowichan Estuary Nature Centre offers meaningful volunteer opportunities for adults and youth as nature interpreters when the Nature Centre is open to the public for visitors, educational program leaders, citizen scientists participating in monthly bird counts, working on eco-system restoration projects, creating and maintaining displays and equipment, and many other volunteers roles needed by all non-profits. Contact the Nature Centre to learn how you can be involved. B’EARTH DAY CELEBRATION AND GREAT HAIR-OFF HAIR CUT!